With comfortable urban lives in Houston, Texas, and career and life goals mostly accomplished, Gail D. Storey and her husband were in their fifties when they decided it was time to test themselves on a new path--a 2,663-mile path known as the Pacific Crest Trail, which stretches from Mexico to Canada. 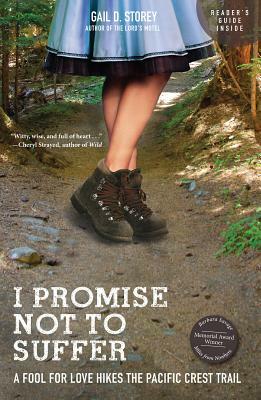 I Promise Not to Suffer is Gail's light-hearted yet heart-felt memoir about her and her husband's adventures and misadventures, deepening marriage, and reflections on being irrevocably changed by life on the trail. She was a novice hiker, while he was an experienced outdoorsman. Removed from their usual routines and living outside in the wilderness for months exposed hidden intricacies in their relationship. Hiking 20 miles a day over mountains, thirsting in the high desert of California, forcing frozen feet into icy socks and boots each morning in the High Sierra, stumbling through lava fields in Oregon--Gail was required to meet the elements on their own tough-love terms. From an encounter with a mountain lion to her mother's battle with cancer at home, she confronts each challenge with wit and brave style. While a dangerous loss of weight forces Gail to leave the PCT after 900 miles, she regains strength and later rejoins her husband on sections until he triumphantly reaches the northern terminus in Canada. Humorous yet honest, this journey of harrowing hilarity and reluctant revelations will be loved by active hikers (appendices include details of their unique ultralight gear and other essential how-to information), fans of female adventure stories, and armchair travelers alike. Want to know more about author Gail Storey? Head to her website today. "At times wrenching memoir, at times hilarious, I Promise Not to Suffer pulls no punches and has a wicked sense of fun. Storey reminds me again of what is possible with a big imagination, a dose of scrappy courage, and a lot of love." "Some have called Gail Storey the Nora Ephron of the wilderness. With her own unique wit, Storey shares Ephron's commitment to creating and tending a long, nourishing marriage. I Promise Not to Suffer is a portrait of a union that does not fray or break under pressure but is forged, toughened, and tenderized." "Of the many books that I have read about hiking the Pacific Crest Trail, none have captured the trail experience from so many different perspectives.Single hikers, couples, and those who stay behind will all enjoy Gail Storey's account of the challenges, the beauty, and the PCT community found along the way." Winner of the Colorado Books Awards 2014 in the Memoir category.